Spring is the season to be in Maine! The weather is gorgeous today, sunny and heading for a high about 70 F, or so they say. One of the nice things about the Maine coast is that many of the things to do are both indoors and out, so you can enjoy the nice weather, or get shelter from the harsher forms, and still enjoy the activities. Tickets for all these locations may be purchased (usually at a significant discount) during your stay at our Freeport Maine bed and breakfast. Spies and military secrets abound this spring at the Maine Maritime Musuem, as their exhibit, Cold Waters, Cold War, traces covert military activity in Maine from Portsmouth Naval Shipyard in Kittery to the Very Low Frequency Transmitter in Cutler, and more. To enjoy the weather, afterward you can take a trolley tour of next door’s Bath Iron Works, and see modern U.S. Navy ships being built, or take a lighthouse or nature cruise, as well as touring the other museum exhibits, buildings and grounds. Spring has indeed sprung at the Coastal Maine Botanical Gardens. 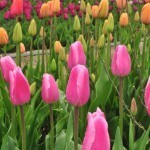 Spring flowers are in full bloom, and there are literally dozens of event scheduled for garden enthusiasts of all ages. The photos of the current flowers, and exhibits are shown on the gardens blog. Meanwhile, for the transportation fan, Owls Head Transportation Museum‘s upcoming event is their Ford & Chevy Auto Spectacular and Antique Aeroplane Show, this weekend, May 28 & 29. In addition to the exhibitor vehicles for the Ford & Chevy spectacular, several of the Musuem’s antique automobiles will be on display on Runway 17 including its 1932 Chevrolet Confederate Roadster and 1940 Ford Woodie Station Wagon. The Museum will also demonstrate a few of its turn-of-the-century automobiles as well as give free rides in Ford Model Ts. Special children’s activities — including our popular styrofoam airplane-building workshop—and Museum tours are planned. There will be plenty of fun for the whole family. The antique aeroplane show will begin at 9:30 a.m., weather permitting. Each of these museums has shows throughout the season, so whenever you are planning your visit to Maine, there will always be something happening.